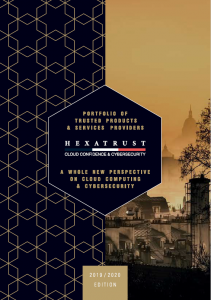 The HEXATRUST club was founded by a group of French SMEs that are complementary players with expertise in information security systems, cybersecurity, cloud confidence and digital trust. Representative of French excellence in innovative solutions, these software and products vendors, system integrator, end users and members representative of the cybersecurity and cloud confidence ecosystem have come together to provide a full range of efficient and consistent products and services dedicated to the security of critical infrastructures, data protection and users security. This combination meets the needs of enterprises, administrations, public and private organizations of all sizes, keen to receive European and French innovative offers, covering all their needs. HEXATRUST also promotes the establishment of a common relationship based on transparency and trust between professionals, end users, citizens and public authorities in Europe and in the whole world. Building on their presence on the European market, HEXATRUST members also want to accelerate their international development by sharing their experience, their networks and means of access to global markets. HEXATRUST will act in close cooperation with professional organizations, users and institutional actors, working to strengthen the chain of cybersecurity and cloud confidence groups, supporting the development of innovation and growth SMEs, future leaders of information security systems.